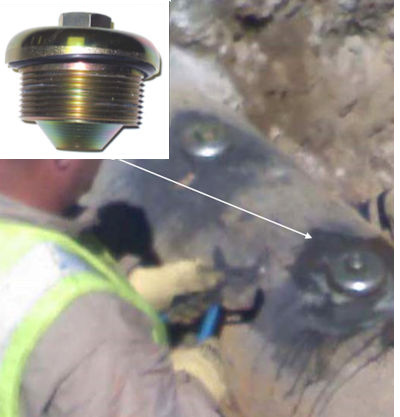 Low-Profile Canopy Plugs are made in response to industry concerns with potential third party damage caused by a mechanical excavator (backhoe). This plug has a low-profile body, a fitted cap contoured to fit a range of pipes and Gas-Free* installation when used with an ALH Tapping Machine. Machined NPT threads to ANSI standards. An "O" ring between the cap and the pipe. A rubber seal bonded to zinc plated steel is positioned under the head of the bolt. Bolt: Custom machined from hex-steel bar to BS970-08M40 specification. The shank is machined to close tolerance maximizing the effectiveness of the bonded seal. Plug Body: Machined from BS940-230M07 specification steel. Provides an exceptional surface finish to produce a clean thread cut. Plug Body Threads: NPT tapered threads to American National Standards Institute (ANSI) standardization. Plug Cap: Contoured cap machined from BS940-230M07 specification steel.